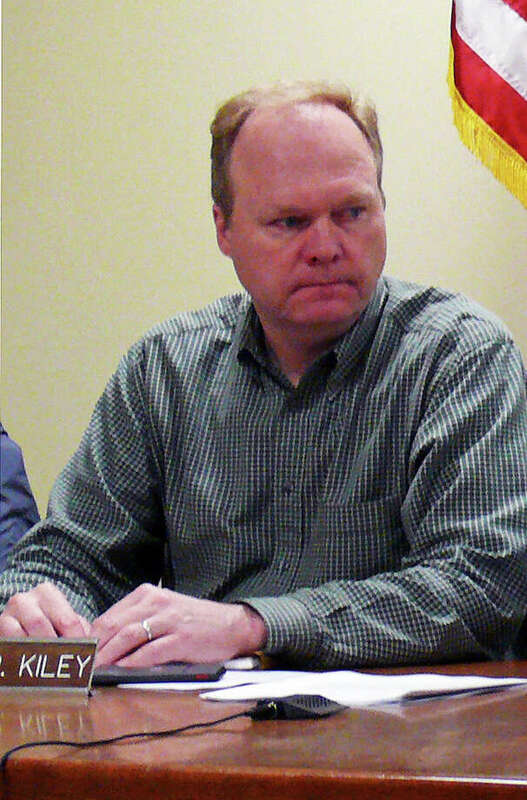 Board of Finance member Kevin Kiley is interested in taking James Walsh's seat on the Board of Selectmen. Two Board of Finance members want to be appointed to complete the term of Selectman James Walsh, who abruptly resigned last week after questions arose over the propriety of his representing clients before town land-use boards. Finance Vice Chairman Robert Bellitto Jr., who lost the first selectman's race to Democrat Michael Tetreau last November, and member Kevin Kiley have both sent letters to Republican Town Committee Chairman James Millington indicating that they plan to seek the party's endorsement for the open seat on the Board of Selectmen at the committee's July 2 meeting. Walsh was elected to his four-year term last November. A final decision on the appointment, which according to the town charter must be filled by an appointee who, like Walsh, is a Republican, will be made by the two Democrats on the Board of Selectmen, Tetreau and Selectman Cristin McCarthy Vahey. The RTC endorsement is only a recommendation to the selectmen, which they are not obligated to follow. Walsh, who continued to represent land-use clients after he was appointed to the Board of Selectmen in May 2010 following the death of Ralph Bowley, resigned Thursday after several members of the Town Plan and Zoning Commission recently raised the question about a potential conflict of interest. Millington said Representative Town Meeting members Ed Bateson and David Becker also initially expressed an interest in the appointment, but have since withdrawn their names. Becker, the RTM's majority leader, lost last year's GOP nomination for first selectman to Bellitto. The RTC chairman said that in making a recommendation to the remaining selectmen, Republicans should choose a person who will not be divisive and who wants to work with the majority Democrats, and not spend the next three years trying to build a base for a future campaign. Last year, when Kenneth Flatto resigned as first selectmen, the choice for an interim first selectman was made by a special conclave of elected Democrats because Walsh and then acting-First Selectman Sherri Steeneck could not agree on a choice. Steeneck was in favor of naming Tetreau for the seat, while Walsh was insistent the interim first selectman not be someone who also planned to run for the office. Should either Bellitto or Kiley be named to fill Walsh's seat, the Board of Selectmen also would appoint a Republican to replace the finance board seat he would vacate.